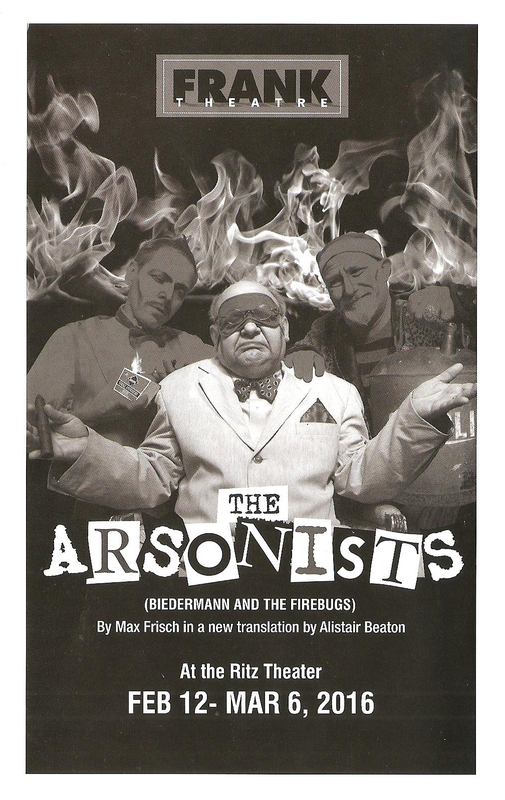 The play makes a whole lot more sense to me after finding out that it was written by a Swiss playwright (Max Frisch) in the 1950s, not too long after WWII and the horrors of the Nazi regime. Last night I couldn't quite figure out what was going on in this town plagued with fires, set by arsonists who surreptitiously and smoothly work their way into people's homes. Now I can see that it's an allegory for how Hitler came to power, preying on the German people's fears, insecurities, and national pride to work his way into their homes and a position of leadership. A similar thing happens to Mr. Biedermann, owner of a hair growth company (Follica Plus!) who's adamant that he would never fall victim to this epidemic of fires. But of course, he unwittingly allows two arsonists to enter his home, turning a blind eye to the oil drums, fuses, and matches they're amassing in his very attic, until it's too late. The hilarious Jay Albright (frequently seen stealing scenes at Chanhassen Dinner Theatres and other stages around town) makes his Frank Theatre debut as Mr. Biedermann, and finds a dark side to his humor. The strong cast also includes Charlotte Calvert as his wife, unhappy about his decision to let these strange men into their home but unable to do anything about it; Nastacia Nicole as the eye-rolling exasperated maid; Jefferson Slinkard and Mark Rhein as the arsonists, and a chorus of firefighters. All are consistent in tone in this highly stylized absurdity, faces painted with exaggerated make-up - grey and black creating a ghostly look, or too bright colors for the women. 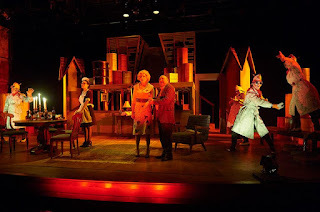 Set and costumes (by Joe Stanley and Kathy Kohl) continue this style. The open stage at the Ritz is dominated by a large two-story wooden that houses the upstairs attic and mysterious spaces below. The costumes range from Mr. Biedermann's sharp gray suit with orange pinstripes, to Mrs. Biedermann's '50s housewife look, to the soot-stained uniforms of the firefighters. Upon reflection, I can see that this play is telling us we have to be vigilant about who we let into our homes, or the leadership of our country, because even though they may be charming smooth-talkers who speak to our fears and insecurities, they might just burn the whole place down once we let them inside. Or else it's just absurd dark comedy. This perplexing and intriguing play continues through March 6 at the Ritz Theater in Northeast Minneapolis.